From the rivers and forests of Oregon in David James Duncan’s The River Why to the tumultuous events in Afghanastan in Khaled Hosseini’s The Kite Runner, “A Novel Idea” has taken Deschutes County readers to places near and far, and to times that stretch from the present back to the 1800s. Every year the popular community read program inspires thousands of Central Oregonians to read, explore and discuss the same book. 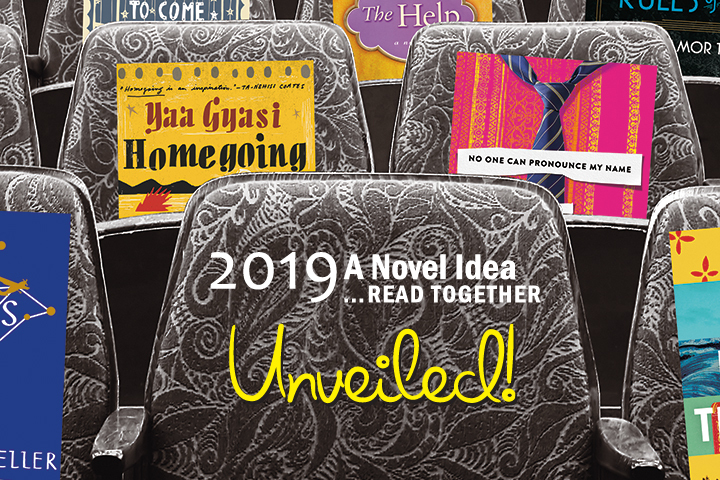 The Deschutes Public Library Foundation will unveil the 2019 “A Novel Idea” selection at a public celebration on Saturday, December 1, at the Downtown Bend Library. Doors open at 6:00 p.m., with a silent auction, light appetizers and a no-host bar for attendees. The book will be revealed at 6:30 p.m., with copies available for sale and for check-out immediately following the announcement. “A Novel Idea” has long been the largest community read program in Oregon. Nearly a month of free programming enhances the chosen book’s themes. Programming includes academic lectures, art workshops, cooking demonstrations and more. Goodrich said more than two dozen cultural programs are in the works; they’ll build and expand the themes of the book for deeper discussion and understanding. New for 2019, the library also provides book club bags to local book groups throughout Deschutes County. The bags include 10 copies of the book and discussion questions and are available for two-week check-out. Book club representatives can call Paige Ferro (541) 312-1063 or email paigef@deschuteslibrary.org to reserve a book club bag. Programming for “A Novel Idea” begins on April 6, 2019, and culminates with the author’s visit to Central Oregon on Sunday, April 28, 2019. All programs, including the author’s presentation, are free of charge thanks to the support of the Deschutes Public Library Foundation. Tickets are available online and at all library locations beginning April 6. For more information about this or other library programs, please visit the library website at www.deschuteslibrary.org. People with disabilities needing accommodations (alternative formats, seating or auxiliary aides) should contact Liz at 541-312-1032.